The acclaimed epic drama based on the novel by Camilo Castelo Branco is getting the high-definition treatment this winter. 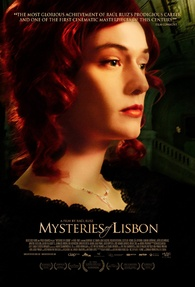 In an early announcement to retailers, Music Box Films will be bringing 'Mysteries of Lisbon' to Blu-ray on December 20. 'Mysteries of Lisbon' plunges us into a veritable whirlwind of adventures and escapades, coincidences and revelations, sentiments and violent passions, vengeance, love affairs, all wrapped in a rhapsodic voyage that takes us from Portugal to France, Italy, and as far as Brazil. In this Lisbon of intrigue and hidden identities, we encounter a series of characters all somewhat linked to the destiny of Pedro da Silva, orphan in a boarding school. Father Dinis, a descendent of the aristocratic libertines, later becomes a hero who defends justice, a countess maddened by her jealousy and set on her vengeance, a prosperous businessman who had mysteriously made his fortune as a bloodthirsty pirate; these and many more all cross in a story set in the 19th century and all searching for the true identity of our main character. Specs and supplements are still unknown, but suggested list price for the 3-disc Blu-ray set is $43.95. You can find the latest specs for 'Mysteries of Lisbon' linked from our Blu-ray Release Schedule, where it's indexed under December 20.